I know this letter will reach you too late. Even as I write you might be passing away from us – to Jesus or your Xhosa tupuna or simply back to the warm earth of Africa, from which we all came. In some ways, like saints in the old days, dying brings you closer to us. We can talk straight to you and not to a title or an office or a press secretary. And who knows what mysteries death holds? Perhaps as you pass over you will for one brief moment see into the hearts of every South African, our hopes, dreams, sufferings and sorrows – only a dying man could survive that. I was born in Durban, in Zululand, so maybe you will see my heart too. Maybe you are reading over my shoulder as I write. I was born in beautiful Durban, in warm, red-earthed Durban, in dirty, colourful Durban. I was born in Shaka’s land, in Gandhi’s city, in Victoria’s imperial outpost. I was born in apartheid Durban, and lived in a whites-only neighbourhood. We went to the beach sometimes, which was mixed-race, but me and my brothers and sisters could also swim in the whites-only freshwater pool. There was a massive slide there, and fountains. The water was sweet after the salt sea. But those whites-only signs gave me the willies. They were so biological, so grotesque – as a child it makes you wonder what hidden germs, illnesses and diseases seemingly healthy people harboured. I feel sick to my stomach to think of it now – sick, and ashamed, because the water was sweet after the salt of the sea. I went to a Catholic school, not a state school, so it was mixed race. But there were more whites than blacks because of the school fees – an early taste of the modern, multi-racial South Africa? There, race was a mystery we tried to fathom. How strange! One boy told me I didn’t want to play with him (I did) because he was “just a Chinaman”. What does race mean to children? Very little, but we learned. None of our teachers were black; all of the cleaners and groundskeepers were. Our home was poor, Madiba, compared to the country I came to. The roof leaked, we slept three kids to a room and ate weetbix when the money ran out at the end of the month. My mother and father worked very hard. But our home was rich, Madiba. We had a servant, Norah, who came once a week to help Mum with the housework although she had children of her own to care for, and a gardener, Joseph. Do you see I don’t know their last names? We didn’t call Africans Mrs or Mr.
Norah is in my earliest memories, her feet were worn out with work and walking. Joseph gave us rides in his wheelbarrow. He killed a snake with his spade. Mum made him curry and sandwiches, which he ate in the shed. Mum said as we got older we kids learned to treat him without the respect our white neighbours received as their right. That – and conscription for the war in Angola – are two reasons we left. Yes, we left, and I am glad and sorry. The Afrikaaners used to call us English soutpiel “salt dicks” – one foot in SA, one in the UK and our dicks in the sea in between. Now many Afrikaaners are soutpiel as well. That gives me no pleasure. Leaving means I will watch you die and be buried from afar – through TV stations’ stupid chatter and in between praise from politicians who would like to bury you and your struggle and the very idea of freedom. I will watch you die from afar like my grandfather and my Gran. When he died it felt unreal because he had only existed as a voice on the phone, a letter, and, once or twice, a visitor rare and surprising as Jesus cooking a braai by the Sea of Galilee. Exile is a kind of death. If you say goodbye to all South Africans, don’t forget us. We are far away but you never forget the land that gave you birth. We are all over the world now. Some of us are ghosts – living on the memories of a golden past before you were released. Not racists, they say. No! But it’s just that the country is a mess now. They circulate photos of once-affluent suburbs now slipped into slums. They exchange stories of violent crime. The exchange rate is low so the stories are cheap unfortunately; there are all too many to go around. Uncle, I’m not one of them. My mum and dad left in 1987, before you were free. They were against apartheid. My mum was even arrested on a Black Sash demo. Man, was Dad scared that day. But of course, I am one of “them” too. I am “white” and could leave. Yes we left P.W. Botha’s prison state and not the Rainbow Nation but facts are stubborn things. White South Africans had more choices than blacks. It’s the same now, ay? I’m into politics like you, Madiba. I want to change the world and why not? In as crazy a country as South Africa it makes sense. I remember the poverty and my own shame as I, a small boy, gave my spare change to a grown man. That’s wrong and unnatural and had to change. When armoured cars are an everyday sight on the highways in the morning and columns of smoke mark the townships in the evenings, then it’s clear the world has to change. But how? If it’s whites versus blacks, what can a white boy do? Joe Slovo, a white man in the ANC and one of apartheid’s “most wanted” showed me one way. For Botha, the only thing worse than a black was a red, so that’s what I became. 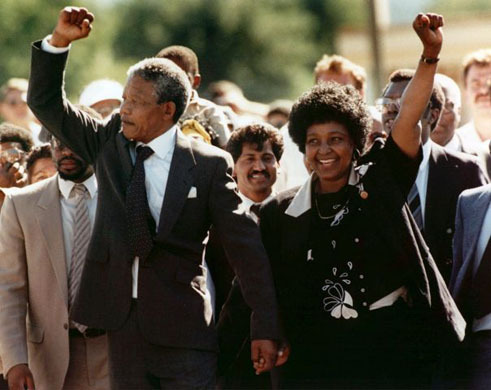 I don’t agree with much of his politics – or with yours, Madiba, but I grew up in a land of heroes. Steve Biko, Denis Hurley, Helen Suzman, Desmond Tutu, Oliver Tambo and hundreds of thousands of others. Real heroes who fought, were imprisoned, beaten and killed for freedom. I know you are no red. You’re more like Giuseppe Garibaldi or Simon Bolivar 200 years too late – freeing people from serfdom and unifying a nation. But Madiba, it was not enough. The police killed 30 miners at Marikana the other day, the miners who were the spear of the nation in the struggle against apartheid. White wealth still rules and inequality is triumphant. Some say unemployment and poverty is worse now than under apartheid, that you freed SA from Botha only to sell it to the IMF. I don’t agree because there are things beyond the control even of heroes. The ANC was the heart of the struggle and you were its head, even in prison, but it was the millions of black workers, Cosatu, that broke apartheid’s back, not your armed wing Umkhonte We Sizwe and its economic sabotage and bombings. I don’t say this to diminish you but to absolve you. Madiba you are a hero in a land of a million heroes and when you die, we will weep, and we will keep fighting. Power to the People! Victory is certain!